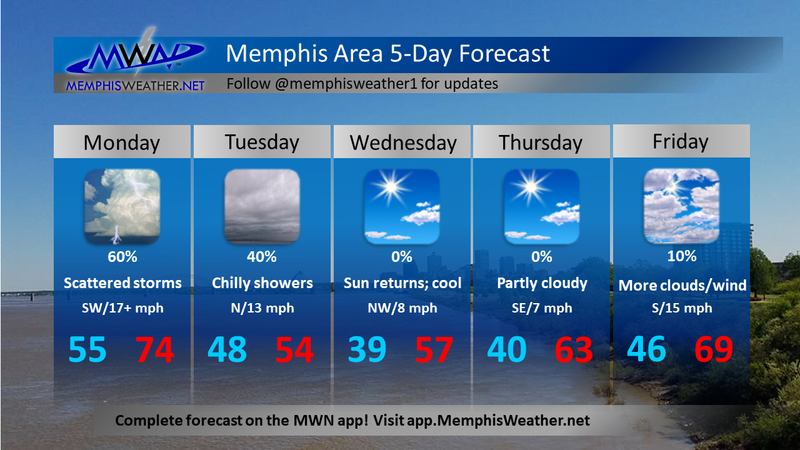 A potent low pressure system will pass just north of Memphis on Monday, but the timing and track of the system will likely result in muted effects for the area as compared to places to our east and south. Before that though, a cold front that slid south through the metro last evening has pushed our beautiful weather from Saturday southward, with a healthy mixture of clouds and sun dominating your Sunday and temperatures remaining about 15 degrees cooler than yesterday. As the aforementioned low pressure starts to energize in the southern plains, a "scout" upper level disturbance ahead of it, combined with yesterday's cold front returning north as a warm front, will result in evening showers tonight and a chance of rain overnight. By Monday morning, wind will shift to the south, a sure sign that the warm front will have moved to our north - but just barely. The low pressure to our west will be moving into the Ozarks, riding the fast train towards Nashville, and triggering scattered thunderstorms ahead of it. Accompanying the low, very strong upper level wind will result in high amounts of wind shear - one ingredient necessary in the production of severe storms. Another key ingredient, instability, will be less than ideal though, given the timing of the storms during the morning to mid-day hours, before the warm sector of the storm has a chance to really boil over. Thus, the lift generated by the approaching low will result in scattered thunderstorms, but the lack of appreciable instability (the main "fuel" for storms) will likely be insufficient to take advantage of the high amounts of shear over the area. 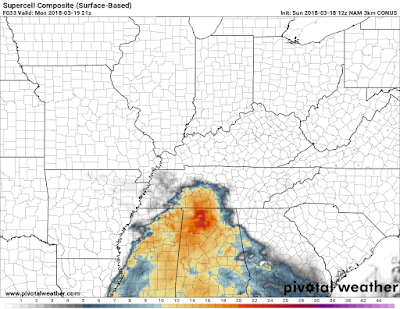 The result: scattered storms for the Memphis area during the post-morning rush hour through lunchtime period (about 9am-2pm) on Monday that could contain a few strong wind gusts and small hail, but likely not producers of damaging wind or hail, nor tornadoes. We are in a Marginal Risk of severe weather (level 1 on the 5-point scale) for Monday, with areas not far to our east a level higher and under a Slight Risk. 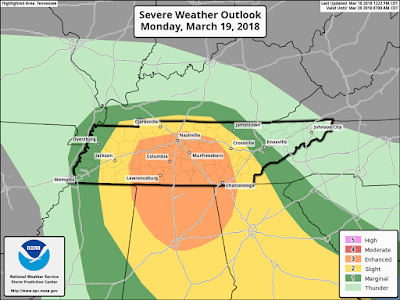 As the low moves east however, it will encounter an even warmer airmass with strong wind shear that could be capable of very large hail, damaging wind gusts, and even a few tornadoes. 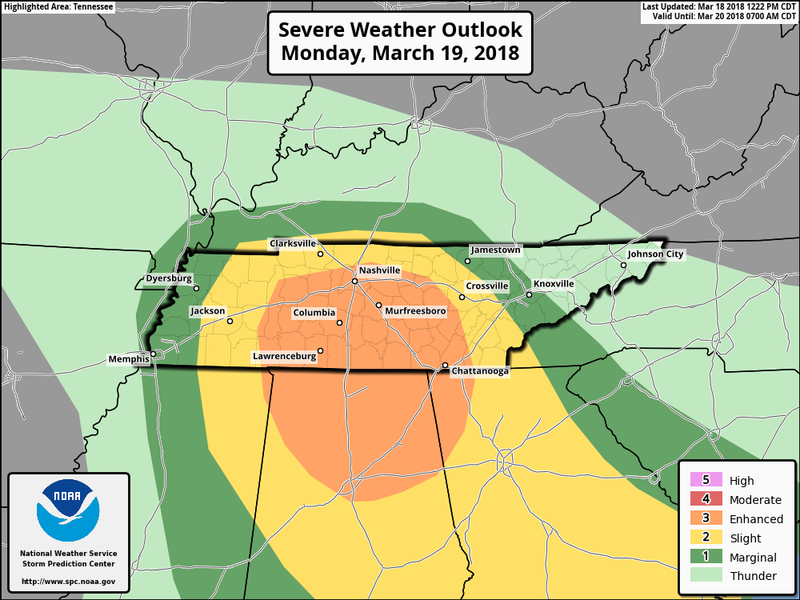 The most likely area for that to occur is from southern middle TN into north AL and northwest GA during the afternoon and evening hours, where an Enhanced Risk of severe weather is currently forecast (level 3 on the scale). In other words, the nearby track of the low earlier in the day will likely keep the Memphis metro from being under as volatile an airmass as areas to our east. As those areas to our east remain weather-aware, we're likely to see some afternoon sunshine that allows temperatures to rise into the mid 70s again. Gusty southwest wind is also expected as the low passes just to our north. Behind this system, clouds wrap around back into the Mid-South as much cooler air filters back in on northerly wind. An embedded upper level system wrapping around the departed low will bring scattered showers on Tuesday with temperatures about 20° cooler than Monday, or in the mid 50s. A couple of cool mornings are expected with lows in the upper 30s Wednesday and Thursday mornings, but highs will slowly climb back into the mid 60s by week's end. 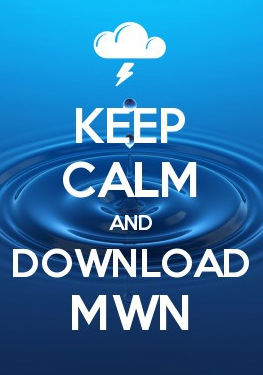 Southerly flow re-establishes itself by Friday with more rain chances arriving in time for the weekend. Stay in touch with our weather updates tomorrow via our social media feeds and mobile app and prepare for a few more chilly days to interrupt the blossoming of spring in Memphis!